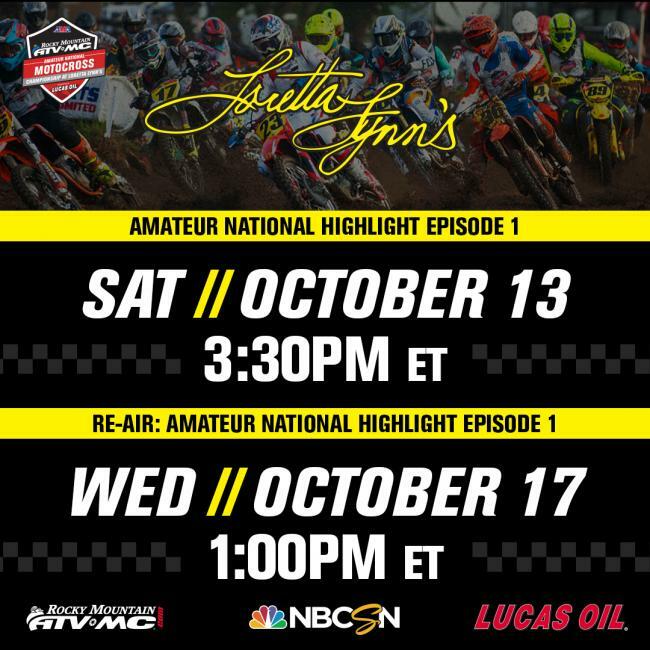 MORGANTOWN, W.Va. (October 10, 2018) – MX Sports and Lucas Oil are pleased to announce that NBC Sports Network (NBCSN) will be broadcasting two one-hour highlight shows featuring the 2018 Rocky Mountain ATV/MC AMA Amateur National Motocross Championship, presented by Lucas Oil. Fans will get an inside look at the 37th annual event held at the historic Loretta Lynn Ranch in Hurricane Mills, Tennessee, which took place July 30 through August 4. The first feature show will air this Saturday, October 13, at 3:30 p.m. EST, including interviews with Seth Hammaker, Mitchell Falk and Derek Drake, along with complete coverage of the highly competitive 250 A class. Daxton Bennick will be introduced as he was the first rider to go 1-1-1 this year and earn the 85cc (9-11) Limited Championship at Loretta’s. John Grewe will reminisce about competing in the very first Loretta Lynn’s Amateur National Motocross Championship held in 1982, and discuss this year as he competes in the Senior 40+ and Masters 50+ classes. The newly crowned WMX National Champion, Jordan Jarvis will be highlighted as she maintains going to public school, training and racing at a National level. Episode one re-air date is set for Wednesday, October 17, at 1:00 p.m. EST. Next month on Sunday, November 11, at 5:00 p.m. EST, the second hour-long show will treat fans to highlights from the 250 B and Open Pro Sport classes, featuring rising stars like Jalek Swoll and Pierce Brown. Up-and-coming youth rider, Haiden Deegan will also be included in the second episode as he went on to win the 65cc (7-11) class championship in Tennessee. A salute to the 2018 class champions, and winner of the Nicky Hayden AMA Horizon Award, Derek Drake, will wrap up the second feature show. The voice of Lucas Oil Pro Motocross, Jason Weigandt, and multi-time Arenacross Champion, Buddy Antunez, will be commentating the shows. Episode two will re-air on Wednesday, November 14, at 4:00 p.m. EST. Racer TV provided an unprecedented 50 hours of live streaming coverage at this year’s event, which featured at least one moto from each respective class. 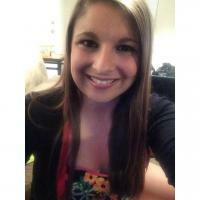 To get more info or watch the archived videos, click HERE. The 2019 AMA Amateur National will return to the legendary Loretta Lynn Ranch on July 29 – August 3. Complete results from the 2018 National Championship can be found HERE. The Rocky Mountain ATV/MC AMA Amateur National Motocross Championship is the world's largest and most prestigious amateur motocross racing program. The national qualifying program consists of 57 Area Qualifiers (February through May) and 13 Regional Championships (May through June), hosted at select motocross facilities across the country. The qualifying system culminates in the National Final (first week in August) hosted annually since 1982 at the home of country music star Loretta Lynn in Hurricane Mills, Tenn. Nearly 22,000 racers attempt to qualify in 35 classes for the 1,470 available positions at the National. Christened "The World's Greatest Motocross Vacation", the National event serves as a launch pad for some of the biggest names in professional motocross and supercross, including Eli Tomac, Ken Roczen, Aaron Plessinger and Justin Barcia. The national program is produced by MX Sports, Inc., a West Virginia-based race production company and sanctioned by AMA. For more information, please visit www.mxsports.com.